Meet the New 4-wheel EDiA EM. 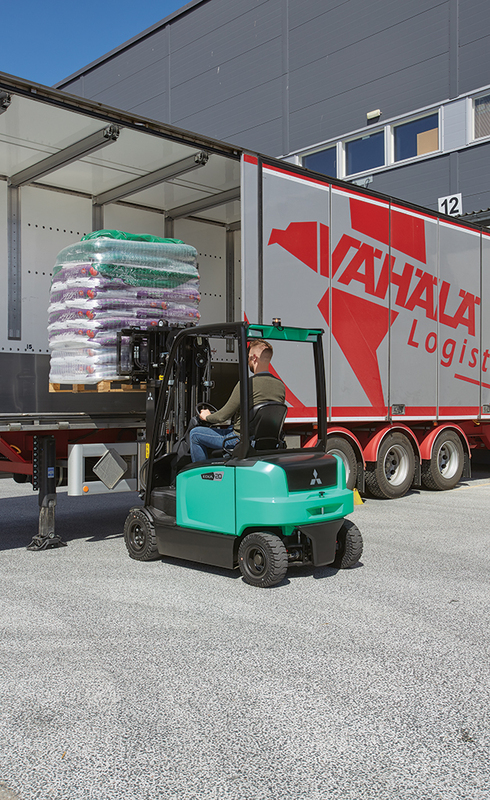 As well as being the market’s most intelligent truck, it’s also one of the most durable. 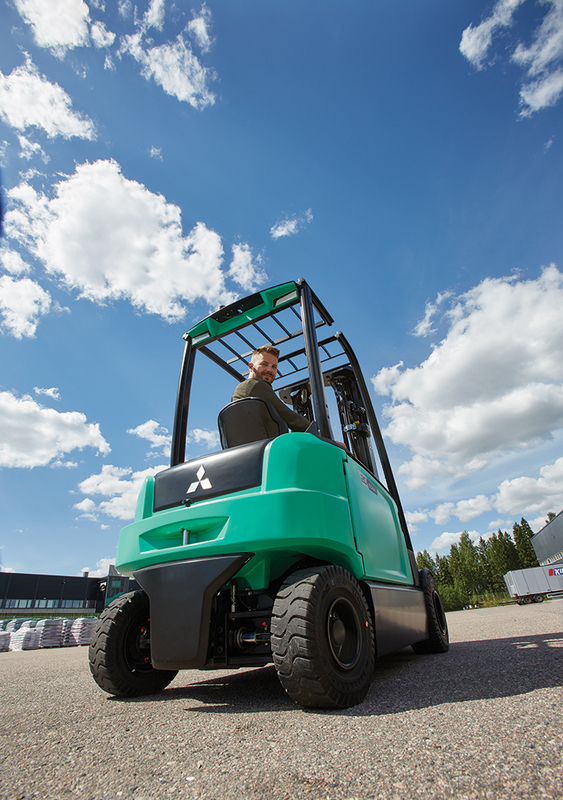 Exceptionally manoeuvrable, powerful and reliable – it’s everything you expect from a Mitsubishi forklift truck. 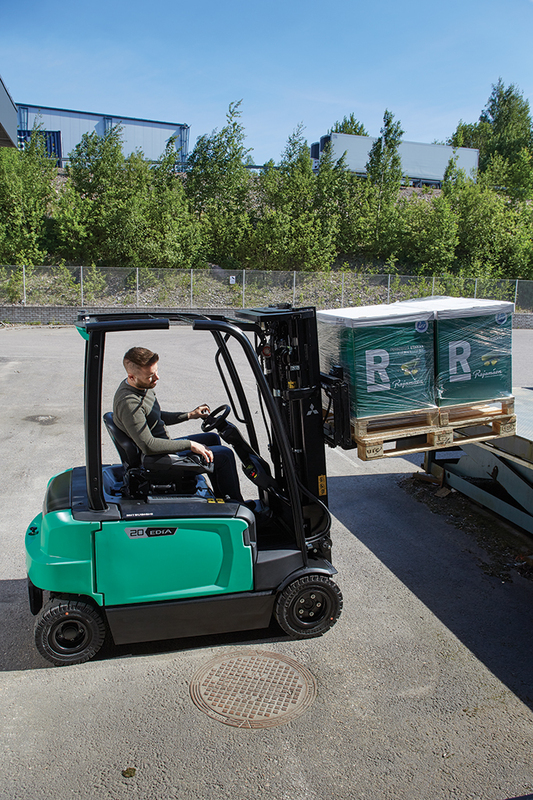 Designed and engineered to perform, these 48-volt four-wheel electrics work intuitively, tailoring their performance to your individual operator. 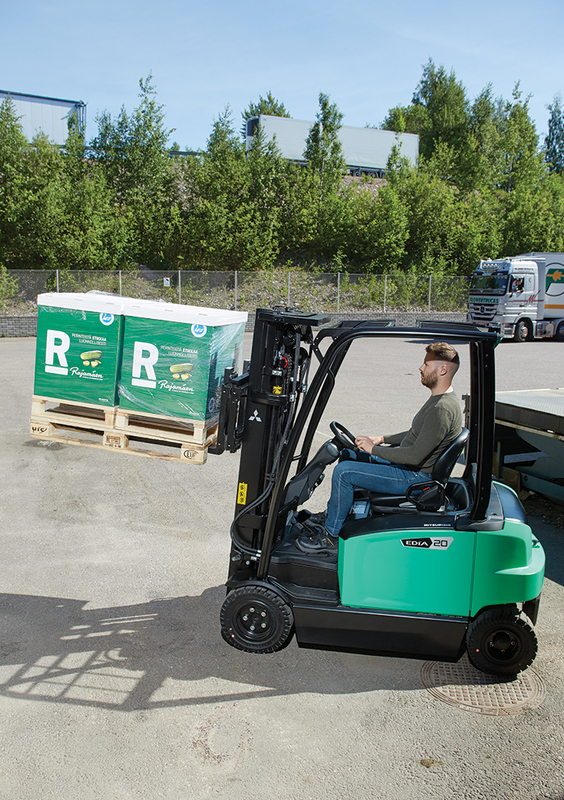 EDiA EM’s sophisticated software analyses behaviour in real-time and automatically adjusts the truck’s behaviour for safe-but-productive performance. What’s more, every EDiA EM has been developed to suit drivers of every size. The truck’s spacious footwell, for example, accommodates size 50+ EU shoes, for maximum comfort – even through the longest shift. Intelligent curve control senses the angle of a turn, and reduces speed earlier in the manoeuvre for maximum stability and accurate, positive cornering. >100° steering axle with dual-drive motors offers smooth ‘on the spot’ turning, with no initial ‘push’. Passive Sway Control dampens any elevated load motion above 2.0 metres by compensating with micro chassis movements – standard with masts over 3.0 metres high. 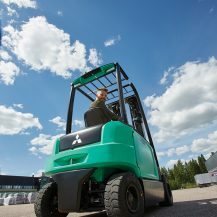 Unparalleled 360° visibility thanks to optimised mast, wheel, dashboard and counterweight design, maximises visibility to load, forks, front and rear wheels for safe, confident operation in tight spaces. 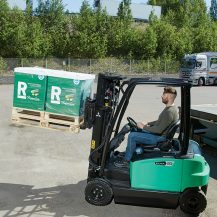 Optimised steering automatically optimises power to steering for consistently smooth operations – regardless of speed or work intensity – for maximum control, comfort and safety. High-efficiency motors offer a high RPM range for precise control when accelerating. Sensitive Drive System (SDS) smooths start and stop movements, increases agility and adapts to the speed of operators’ foot movements. ECO mode encourages natural, smooth operation with optimal energy efficiency; ideal for long shifts, training, new and part-time users. PRO mode maximises performance parameters, giving full control to more experienced operators in intensive situations. Custom settings can be fine-tuned by a service engineer to perfectly match any given application, scenario or need using TruckTool. Fast-access battery compartment offers easy opening for maximum ventilation during charging and quick battery checks and maintenance. Sealed connectors reduce the need for maintenance and repair. Innovative modular design uses universal parts for quicker service and reduced downtime. High visibility design offers minimal ‘death angle’ for improved safety, while eliminating unnecessary driver movements to keep drivers fresh. Precision tilt and side shift easy, fine control makes important and difficult movements faster, and safer. 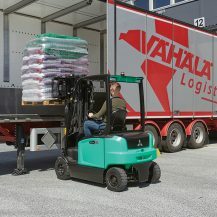 Load-sensing hydraulic system automatically adjusts truck performance when handling loads at heights around 2.0 m – for consistently safe and efficient operations. Optimised free-lift cylinder uniquely incorporates hoses to allow for improved visibility through triplex masts. High-durability hoses are resistant to wear and wide-ranging temperatures – ensuring minimal downtime and disruption. Large, ultra-comfortable operating space has been enhanced to meet the needs of drivers of all shapes and sizes for fatigue-free operation. Spacious footwell accommodates size 50+ (EU) shoes ensuring – whatever their size – operators enjoy a natural, ergonomic foot position. Easy-access swaying entrance allows fast and smooth entry to compartment, reducing strain on operators’ knees, backs and heels. Extra-large entry step with offers good grip, ensuring safe, no-slip entry and exit – whatever the footwear. Wide open cabin enables quick, ergonomic access and a range of comfortable driving positions. F2 thumb-control button allows you to double the number of controls – without taking your eyes off the load. Narrow inclined dashboard enhances perception of surroundings – giving even greater visibility to the front and sides of the truck. Optimised pedal positioning encourages a more natural foot position for drivers of all sizes – short and tall included – to keep fatigue at bay. Contoured accelerator pedal with grooves allows complete control of pedal movements – for safe and precise performance. Elongated grab bar helps drivers of all heights. Flat, decluttered floor with exceptionally spacious footwell increases comfort for distraction-free operations. Clear informative full-colour display is easy to read from any angle (even direct sunlight.) It’s perfectly positioned for operator reference and doesn’t reduce the truck’s all-round visibility. Touch-sensitive fingertip controls are spring-loaded for a natural feeling; the gentler the touch, the finer the control. 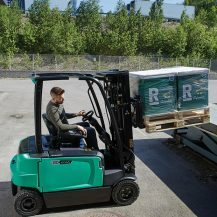 Highly responsive steering wheel automatically optimises power to steering for consistently smooth operations – regardless of speed or work intensity – for maximum control, comfort and safety. Perfectly weighted steering featuring small, lightweight steering wheel – with a light-but-firm feel – gives confidence and manoeuvrability at all speeds. Ergonomic self-centering steering wheel with knob at 8 o’clock position offers exceptional visibility, control and comfort. 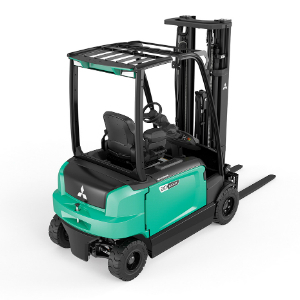 High-lift traction control for heights around 2.0m ensures steadier and more controllable chassis movements in high lifts. Class-leading, low-noise gearbox keeps the truck and surrounding environment quieter than ever before.